That seems like a LOT of features for any magic product. I have the book, I’ve read the instructions and watched the online video. 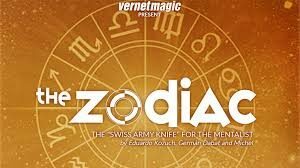 One thing I did notice is The Zodiac video states from the beginning that it is based on a product they (Vernet) released twelve or thirteen years ago called “Astrological Sign” by Eduardo Kozuch and Vernet Magic. I think Devin Knight also used a version in his dictionary test called “Word Sight”. That may give you an idea of the very basic methodology, but it certainly will NOT reveal the guts of The Zodiac. This is a new, simplified method of performing the earlier effects. If you are familiar with Astrological Sign, you know that, although it performed as advertised, it was not easy to learn all the nuances to make it convincing. Vernet has released an effect similar to Astrological Sign, but definitely different enough to NOT be called a re-release. ly learned. You can pick up on star signs, earth signs, and related playing cards in very short order. The method is really simple. To get into the specifics of your spectator’s personal traits is going to require some memorization. Obviously, if Vernet is offering you a complete mentalism act-in-a-pocket it’s going to require more than simply opening a package. I will say.. the effort is worth it. Just like a great stacked deck, the effort is paid back many times over. Folks love to hear someone tell them about themselves. Knowing facts, star signs, traits and features are reputation makers.. IF you can pull it off.. and The Zodiac certainly gives you a great launching point. I have to say I agree with the sales copy, as diverse as it may sound. All you need to perform most of the feats is your vision. Memorize the finer points and you DO have a complete act. I would not say you’re ready to go onstage.. but I would say you’re ready for walk around and parlour performances. You can get a solid six to eight minutes from Zodiac and keep your audience thoroughly involved. discover all the basic information. It run about 20 minutes. $25.00 From dealers who sell the Murphy’s Magic line of products..